Since ancient times in Japan, samurais and ninjas have fought for their respected sides. Now with these UPSPCC-printed cards, you reign over the fate of these immortalized warriors, and it will be your playing card stealth that will determine the outcome of this epic feud. 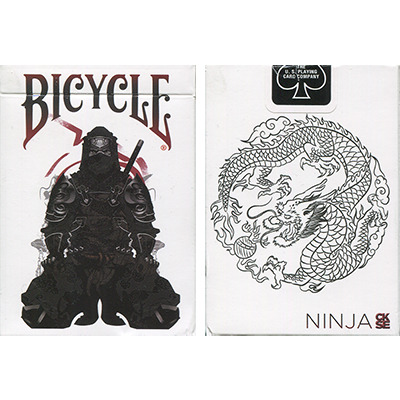 Open these beautifully designed tuck boxes to unleash your inner ninja or samurai. Each striking tuck features stunning hand-illustrated designs of the warriors, battling to defend the honor of the hand that rules the deck. Reflecting the darker side of the Feudal world are the stealth ninjas. One side of this tuck box features ninja warriors cloaked in disguise with only their eyes exposed. Armed with razor sharp swords and flying ninja stars, the ninjas of this deck are prepared for the ultimate battle of cards. The intricate design of the FEUDAL ninja warriors and fierce stylized dragon lingering on the sidelines are indicative of an ancient Japanese society. The facade of an aggressive ninja's head in gleaming black coats the back of these cards. Like the ninja himself, his weapons of choice-twin sais and deadly ninja stars-are cleverly camouflaged into the design. The design centers on a gold-foiled ninja star and dragons, from which the ninja harnesses his strength and auspicious powers. The front of the cards carry a traditional layout with custom geometrically designed pips. The cards are infused with a dragon tail border. Each deck features contrasting colors to allow for easy reading. After all, there is nothing worse than needing to grab your reading glasses or turn up the lights during an epic battle of cards. No details were spared bringing to life this ultimate deck of cutthroat ninja warriors.